Bounce TV is on the upswing. Recently, the network announced ratings have increased for their TV shows Family Time and Grown Folks. According toBounce TV, ratings for the second episode of Family Time‘s fifth season were up 43% in the 18-49 demographic. Additionally, the 18-49 demo ratings for Grown Folks increased by an impressive 49%. ATLANTA, Oct. 12, 2017 — The second episode premiere telecasts of the Bounce original comedies Family Time and Grown Folks racked up strong double-digit viewership increases versus their week one premieres. New Family Time episodes premiere on Bounce Monday nights at 9:00 p.m. ET/PT followed by new Grown Folks at 9:30 p.m. ET/PT. Bounce (@BounceTV) premieres new episodes of the hit comedy Grown Folks Monday nights at 9:30 p.m. ET/PT. Grown Folks is about two blue-collar couples who share a duplex while navigating life, marriage and friendship, in Honeymooners-esque fashion. The series stars Gary “G Thang” Johnson as a frugal skycap for an international airline, Tracey Cherelle Jones as his wife Jillian, a pragmatic social worker, Jay Phillips as zany plumber James and Caryn Ward Ross as Jay’s stay-at-home wife Brenda. ViBounce (@BounceTV) premieres new episodes of the hit comedy Family Time Monday nights at 9:00 p.m. ET/PT. Family Time stars Omar Gooding (Tony) and Angell Conwell (Lisa) as a pair of high school sweethearts living a new life in the suburbs with their mischievous children, played by Bentley Kyle Evans, Jr. and Jayla Calhoun. Visit BounceTV.com for more info. Visit BounceTV.com for more info. Bounce premiered the second episode of Family Time’s fifth season on Monday, Oct. 9 at 9:00 p.m. ET. The telecast was up +25% in Households (254K), +43% in Persons 18-49, +28% in P25-54 and +23% in P2+ versus the fifth season premiere on Oct. 2. It was also a top-three show among African-Americans P18-49 and P25-54, and its median age (40) dropped seven years from the premiere episode last week. Grown Folks, Bounce’s newest original series which debuted last week, also saw tremendous gains in week two, led by increases of +32% in HHs (252K), +49% in P18-49, +27% in P25-54 and +29% in P2+. It was among the top three programs in the delivery of African-Americans P18-49 and P25-54 on Monday night at 9:30 p.m. ET. Like Family Time, the Grown Folks audience age also skewed younger, dropping seven years (to 44) versus the series premiere. Family Time stars Omar Gooding (Tony) and Angell Conwell (Lisa) as a pair of high school sweethearts living a new life in the suburbs with their mischievous children, played by Bentley Kyle Evans, Jr. and Jayla Calhoun. Grown Folks is about two blue-collar couples who share a duplex while navigating life, marriage and friendship, in Honeymooners-esque fashion. 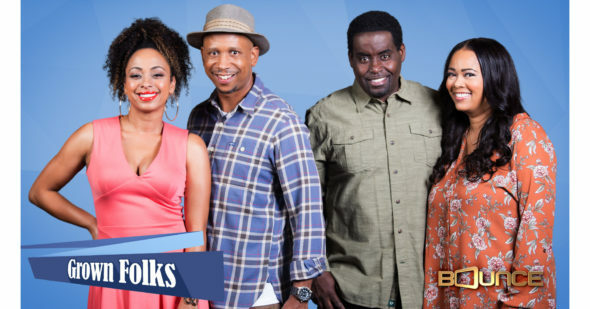 The series stars Gary “G Thang” Johnson as a frugal skycap for an international airline, Tracey Cherelle Jones as his wife Jillian, a pragmatic social worker, Jay Phillips as zany plumber James and Caryn Ward Ross as Jay’s stay-at-home wife Brenda. What do you think? Do you watch Bounce TV? Are you a fan of Family Time and/or Grown Folks? More about: Bounce TV TV shows: canceled or renewed?, Family Time, Family Time: canceled or renewed?, Grown Folks, Grown Folks: canceled or renewed? Bounce is awesome I love the movies especially brown sugar love and hip hop with Taye Diggs and Sonata brothers sheamar Moore and Morris chestnut boomerang just naming some black pictures they bring back memories and I hope saints and Sinners get renewed keep up the good work.